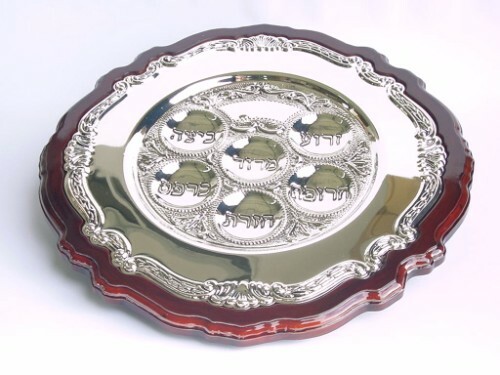 Polished silverplate Seder tray will command attention from everyone at your Passover Seder table as each part of the haggada story is read. Fancy scroll designs finishes the rim of this smooth wide border surrounding the Passover symbols placed in the center. The story read from the Passover Haggada recounting the end of the Jews slavery to Pharoah and the Exodus from Egypt is accompanied by various symbolic food items. 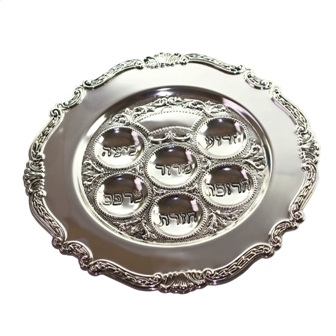 This Seder plate has a round indention for each of the six items [only the matzah is not placed here] with the hebrew word for each symbol engraved in the center. Marked places for the Zeroa [shankbone], Beytza [egg], Carpas [greens], Haroset sweet mixture reminding of the morter], Hazeret [horse radish], and Marror [bitter herb] are placed in two arches below an engraved arch design and surrounded by more scroll accents. The wide polished border is finished with raised scroll engravings. 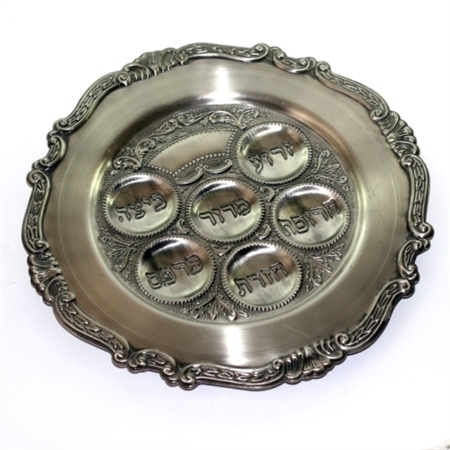 This Seder plate is available in a burnished Pewter finish and a shining silverplate finish. For a small additional cost, the silverplate version can be set within a polished natural wood base that gracefully frames the inner tray and gives it a more solid look and feel.